The World of Oz slot by Rival Gaming is themed to the famous Wizard of Oz fairy tale and movie. Cartoon styled symbols depict Dorothy and Toto, the Magic Shoes, the Flying Monkey and the Good Witch. The characters of the Scarecrow, the Tin Man and the Lion can trigger a drop feature, the Wild is the Wicked Witch and the Wizard of Oz will trigger Free Spins. Relive Dorothy´s adventures as she travels along the yellow brick road to the Emerald City. 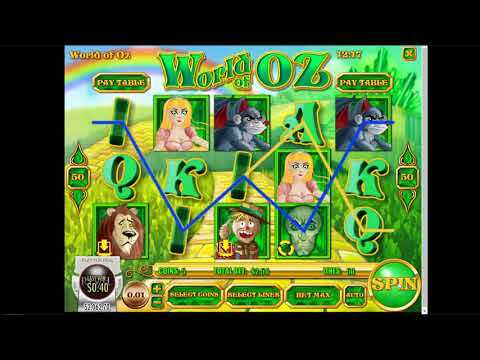 The World of Oz slot by Rival Gaming has 5 reels and up to 50 paylines. If three identical symbols of the Scarecrow, Tin Man or Lion appear along an active payline they burn and start the drop feature where the symbols above fall into their places. Once at least 3 symbols of the wizard's head land anywhere on the reels, they activate 12 free spins. During the round, if the Wild symbol of the Witch is used to create or extend a combination it will multiply your payout an additional 10 times. Regular symbols are a mixture of themed and playing card letters A, K, Q, J, 10 and 9. They create winning combinations when 3, 4 or 5 identical symbols land along an active payline, on adjacent reels, starting with the first reel. The characters from the Wizard of Oz movie that appear on the reels are the Scarecrow, the Tin Man, the Lion, a Flying Monkey, Glenda the good Witch, a pair of heels and Dorothy holding her dog Toto. Special symbols are also themed to the film. The portrait of the Wicked Witch is the Wild symbol, it replaces all symbols except the Scatter and multiplies your winnings for a combination 5 times. The Wizard of Oz is the Scatter, it can create its own combinations and launches free spins. After the slot launches, a short animation showing the start of the story play, if you don´t want to watch it you can press the skip intro button. During the game, you can activate up to 50 paylines by clicking on the Select Lines button. The + and - buttons near the coin let you adjust the coin value from 0.01 to 0.25. You can also adjust the bet per line from 1 to 10 using the select coins button on the control panel. The maximum total bet is 125 coins. The round Spin button gets the reels spinning or you can use the Auto button to set automatic spins, but onlly if you are playing for real money. You can find out the exact multipliers of payouts for each symbol by clicking on the Pay Table button. If you have enjoyed playing the World of Oz online slot for free at NeonSlots.com, then try other free Wizard of Oz slots, Winnings of Oz or the Wizard of Oz - the Road to Emerald City.